A cloud server is a virtualized server running Windows or Linux operating systems that are instantiated via web interface or API. Cloud servers behave in the same manner as physical ones and can be controlled at an admin or root level, depending on server type and cloud hosting provider. Cloud storage is saving data to an off-site storage system that is usually maintained by a third party. Rather than saving data and information on your hard drive or local storage device, it is saved to a remote database. The connection between your computer and the database is established through the Internet. With cloud storage, users are able to access their data from any location that has an Internet connection. Cloud storage systems are most often housed in facilities called data centers. A very basic cloud storage system needs just one data server connected to the Internet. A subscriber to the service (client) sends files to the data server via the Internet. The server records the information then the client accesses the data server through a web-based interface to retrieve the data. The files are then sent or the client has access to manipulate the files on the server itself. In order to protect data from hardware failure or other damaging circumstances, cloud storage providers will often store the same data on multiple machines. This is called redundancy. You don’t have to deal with managing your storage; your provider handles it. No more migrating data or worrying about failed hard drives. Businesses save money by not having to buy expensive servers and other equipment to store their data safely and securely. There is no limit to the amount of data you can store. You pay for what you need. You must choose a reliable provider. You are submitting sensitive data to a third party, so you must trust them. Storing your data in the cloud can expose them to the possibility of being attacked or harmed even after your virus database is updated. That’s why it is important to go with a trusted provider. 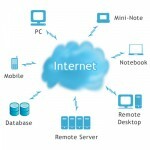 For more information on cloud computing, click here. The “Tech 101” series is designed to give basic, overview information on technology terms, practices and systems. If you have any questions or comments, please feel free to leave feedback.